With this bill, we taxpayers who pay their wages are being shortchanged. Every tax break for the middle/ poor class will disappear by 2025 to where it will end up being the biggest tax increase ever at $4.5 trillion dollars. When the republicans are questioned about this fact, they are saying that these cuts can be extended at a later date, but there is nothing guaranteed in writing. If these tax cuts were to be extended, the US deficit would be increased by an additional $4.5 trillion dollars. We folks who make less than $75,000 annually will end up paying for the biggest donor class/ corporation tax cut ever at about $6 trillion dollars. The net amount of $1.5 trillion dollars is the figure that the republicans use to advertise the cost of their tax cut bill where most of this net amount will be added to the US deficit over a 10 year period. If this slap to the average Joe workers/ taxpayers was not bad enough, many republicans are planning to personally profit bigly from the passage of this 2017 tax cut bill. “Under current law, the highest income earners can end up having their pass-through income taxed at the highest 39.6 percent rate. But the House- and Senate-passed tax bills are both designed to reduce taxes on that income, with the goal of giving pass-through entities a tax cut comparable to the bill’s other reductions in corporate rates. Comprehensive explanation of the #TrumpTaxScam … take a look!! Never in my lifetime did I ever thought I’d see something like this!! Despicable … they have no shame!! These republicans in the WH and the US Congress exemplify the corruption of big monies in our politics. Consider this comment from Rep. Chris Collins (R-NY), one of those New York Republicans who theoretically might be upset that his constituents would be expected to lose under the GOP bill. The Republican donor class — i.e., corporate and wealthy America — expects Republican lawmakers to pass a Republican tax bill. It’s as simple as that. We know donor pressure is a big reason that Republicans kept trying to repeal Obamacare. But they still failed. Tax reform is their next — and maybe last — chance to deliver a big legislative victory. Republicans know it. So House Republicans aren’t going to sweat the details. Their donors put them in office to cut their taxes. On another note … did you receive an email About WordPress new privacy rules? These folks greed knows no bounds. What is happening to Puerto Rico is inexcusable. They have no shame. We are all going to be wearing the scars of this dark period for years to come. 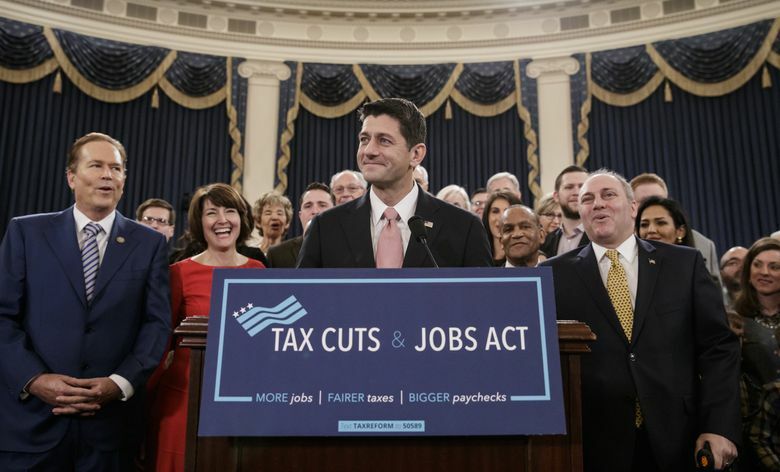 On the blog, “Crooked.com” the writers referred to the republicans’ tax cut bill as the 2017 Donor Relief Act.” There is no legitimate reason for passing this horrible bill except that it meets the demands of the donor class. Why couldn’t they do something right for a change like passing a bill like the 2010 Simpson-Bowles proposal? A good lighting bolt could be welcome right now! Nothing short of a miracle will derail this tax cut bill from passing. Of course, this is the right season for it and I am not above saying my prayers towards this end. These republicans have forgotten who really pays their salaries. They have sold out their constituents for 30 pieces of silver. Thanks, Gronda. I have been AWOL the last couple of months, fretting about the fiasco in DC. None of it will really affect me after 10 or 15 years (a generous time table since I am 83 now, and although it is feasible to live to 100, I count each day as a bonus now. 🙂 I shudder to think of the evil coming down the pike for future generations. I want to take this moment to wish you and yours a wonderful Happy New Year in 2018. Thanks a million times for being a part of this blogging family. This post from Gronda Morin is excellent… sort of like a kick in the gut! More info on the tax bill that will take your money unless you earn over 75.000 a year. I should have referred to this tax cuts bill as the 2017 Donor Relief And US Lawmakers Windfall Act. Thanks a million times over for all of your support and for this reblog. Concerning the corruption in the U.S. Congress. We now know that we can count on our US Congress republican representatives to NOT DO ONE THING that would benefit the average Joe voters. The only silver lining in all of this, is that we will return the sentiment.